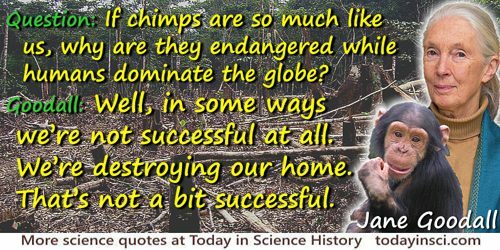 English primatologist, anthropologist and ethnologist who spent 45 years studying chimpanzee social behaviour. 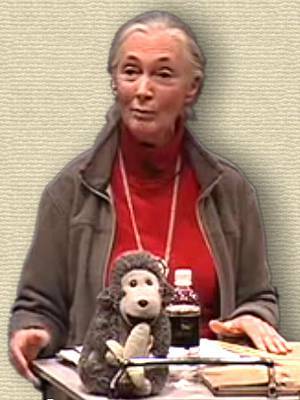 She founded the Jane Goodall Institute. Question: If chimps are so much like us, why are they endangered while humans dominate the globe? Goodall: Well, in some ways we're not successful at all. We're destroying our home. That's not a bit successful. In Virginia Morell, 'The Discover Interview: Jane Goodall', Discover (Mar 2007), 28, No. 3, 52. Farm animals feel pleasure and sadness, excitement and resentment, depression, fear, and pain. They are far more aware and intelligent than we ever imagined … They are individuals in their own right. In preface contributed to Amy Hatkoff, The Inner World of Farm Animals (2009), 12-13. I don't care two hoots about civilization. I want to wander in the wild. Repeating a remark made in the past to Dr. Leakey, as quoted by Nan Robertson in 'Three Who Have Chosen a Life in the Wild', New York Times (1 May 1981), B36. The article featured three primatologists (Dian Fossey, Biruté Galdikas and Goodall) at a symposium, 'What We Can Learn About Humankind From the Apes' at Sweet Briar College campus. I feel a desperation to make people see what we are doing to the environment, what a mess we are making of our world. At this point, the more people I reach, the more I accomplish. … I miss Gombe and my wonderful years in the forest But if I were to go back to that, I wouldn’t feel I was doing what I should be doing. Answering the question, “Why have you transferred your energies from animal research to activism?” From interview by Tamar Lewin, 'Wildlife to Tireless Crusader, See Jane Run', New York Times (20 Nov 2000), F35. 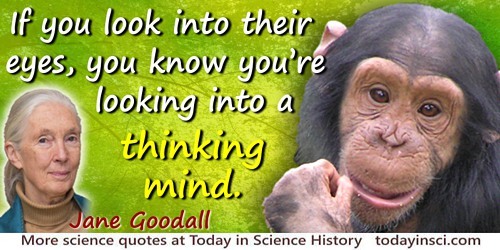 If you look into their [chimpanzees] eyes, you know you’re looking into a thinking mind. They teach us that we are not the only beings with personalities, minds capable of rational thought, altruism and a sense of humor. That leads to new respect for other animals, respect for the environment and respect for all life. From interview by Tamar Lewin, 'Wildlife to Tireless Crusader, See Jane Run', New York Times (20 Nov 2000), F35. Many scientists have spent years collecting information about the effect of human actions on the climate. There’s no question that the climate is changing, I’ve seen it all over the world. And the fact that people can deny that humans have influenced this change in climate is quite frankly absurd. From Facebook video 10155220356117171 (31 Mar 2017) posted by Dr. Jane Goodall. Meat-eating has not, to my knowledge, been recorded from other parts of the chimpanzee’s range in Africa, although if it is assumed that human infants are in fact taken for food, the report that five babies were carried off in West Africa suggests that carnivorous behavior may be widespread. In 'Chimpanzees of the Gombe Stream Reserve', collected in Primate Behavior: Field Studies of Monkeys and Apes (1965), 473. Some humans are mathematicians—others aren’t. In In the Shadow of Man (1971), 252. 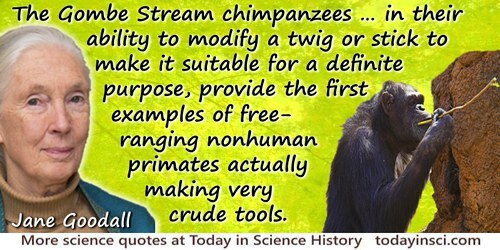 The Gombe Stream chimpanzees … in their ability to modify a twig or stick to make it suitable for a definite purpose, provide the first examples of free-ranging nonhuman primates actually making very crude tools. 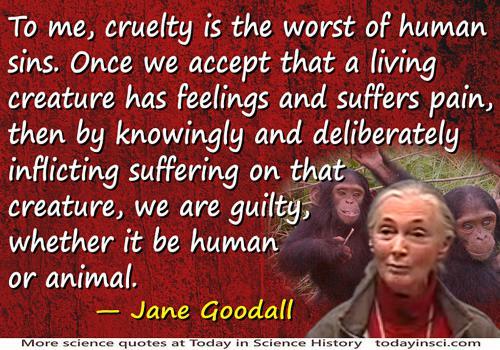 To me, cruelty is the worst of human sins. Once we accept that a living creature has feelings and suffers pain, then by knowingly and deliberately inflicting suffering on that creature, we are guilty, whether it be human or animal. As given, without further citation, in Bollimuntha Venkata Ramana Rao, The Book of Uncommon Quips and Quotations (2003), 12. Please contact Webmaster if you know the primary source. 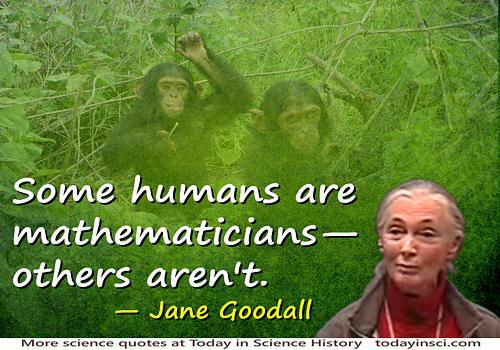 3 Apr - short biography, births, deaths and events on date of Goodall's birth. Video: What Separates Us From Chimpanzees? 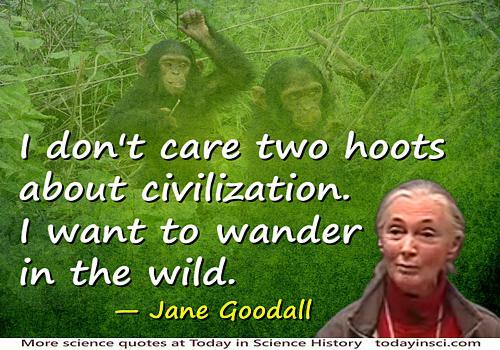 - Jane Goodall talk (2007, 29 min). My Life With the Chimpanzees, by Jane Goodall. - book suggestion.